The image of twisted, clutching, dead trees is a staple in classic horror films. 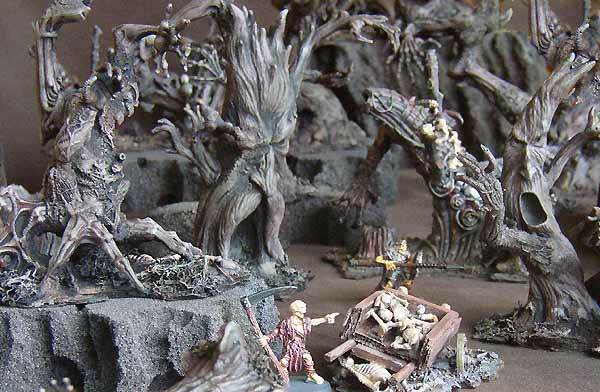 I recently made a whole forest of them for a special Mordheim scenario. The trees above are mostly made with arms and legs cut off of various action figures (particularly Spawn figures). The two trees with faces actually came that way (from a kid's toy). The trees are based up on pieces of press board. For undergrowth, I used dried out grape stems and lichen (glued down with LOTS of white glue for strength). I made supplemental tree stumps from various toys, armorcast pieces, and even dry pumpkin vines! 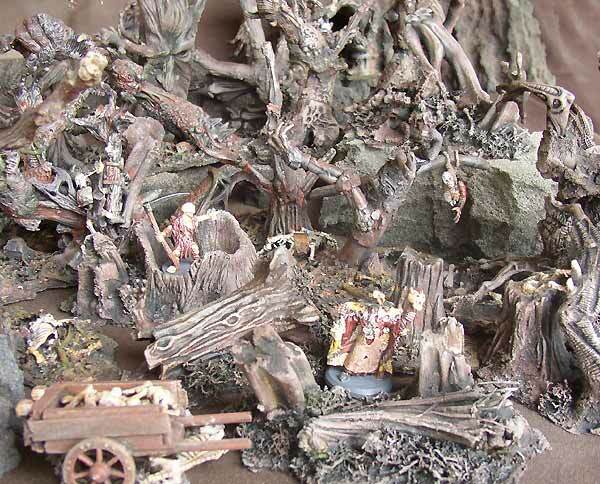 Finally I added various skeletons, dangling from, decaying on, or clutched in the various tree branches and stumps. I primed the trees with black spray paint, then sponge painted them with acrylic paints, mostly brown, tan and grey. The skeletons were painted white and washed with a light brown.